There are many IP cameras are able to deliver video streams protocol RTP / RTSP. Media server can be connected to the IP camera, directly using RTP / RTSP, and render video streams take their end users have different protocols for example such as: RTMP, HDS or HLS, depending on the client devices. Wowza Streaming Engine stream could directly streaming from IP camera, it must be configured external IP address but if you have multiple IP Cameras, then assign each camera external IP address will be costly and not entirely correct. I have already said that in such situations, you can use an intermediary server FFMPEG, which will be in the same subnet as the IP cameras. It will pick up and convert streams from IP cameras and sends them to the Wowza Media Server RTMP protocol. 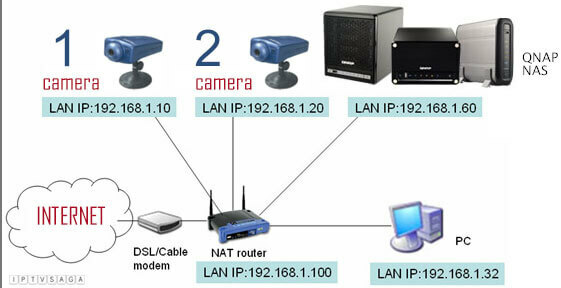 Router can act as a VPN client for multiple cameras. Virtual channel to be established between the router and the VPN server will allow the media server to collect streams from IP cameras, with no need for them to install the external IP address. I show, how to configure VPN client and VPN server’s at next article. In my opinion in the near future in the administrative interface IP cameras can specify the IP address and port of the media server to which to send the stream, then all will be quite simple.